After evaluating the privately-contracted submissions from the City of Toronto’s Co-ordinated Street Furniture Program, the design jury has awarded the contract to Astral Media Outdoor. Astral gained some notorious bad press recently when they threatened to sue IllegalSigns.ca and proprietor Rami Tabello for accusations that the advertising behemoth is refusing to remove illegally-retained billboards around the city. This also upsets the Toronto Public Space Committee, who say that the street furniture program will actually increase the square footage of advertising allowed on the streets, despite the City’s directive that the total square footage of advertising on street furniture be reduced. The TPSC believes that the discrepancy comes from an inaccurate accounting by the City of our current street furniture inventory. The anti-advertising activist group also says that the reconfiguration of ad placement will more than double the amount of illuminated, eye-level advertising that is perpendicular to the sidewalk [press release PDF]. 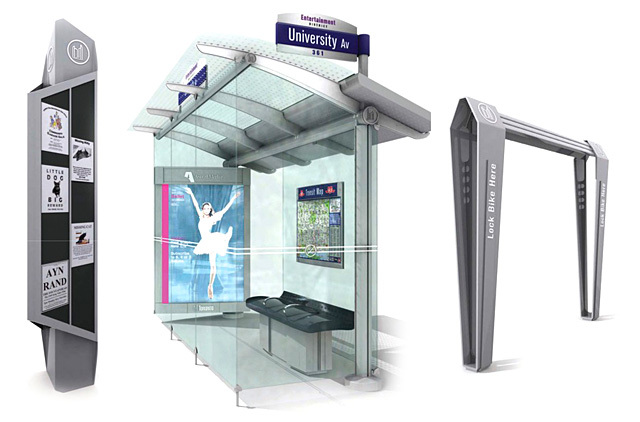 Astral Media’s designs are not unfamiliar to Torontonians: Astral/Kramer Design Associates are responsible for the INFOTOGO interactive advertising/information pillars and swooping glass bus shelters, which Astral claims were inspired by the architectural lines of City Hall. The new, revised pillars (or as Astral is calling them, the TOstreetsmart® INFOTOGO® 100 Series pillars) will now feature high-definition video screens programmed with tourism and informational “content” produced by Astral and partner Rogers. Astral contracts more than 3,700 advertising faces throughout major cities in Ontario and Québec. 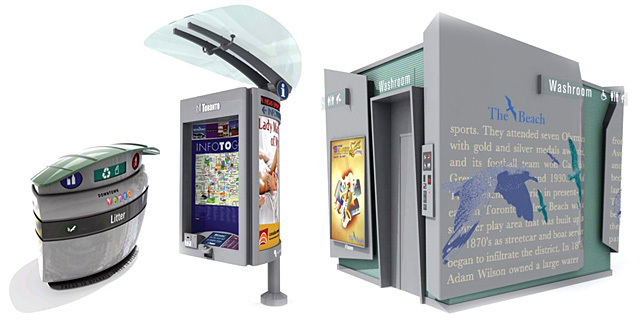 The Toronto street furniture contract runs through 2027 and involves access to 5,000 transit shelters, 12,500 trash bins, 1,000 bicycle racks, public benches and 2,500 newspaper boxes. 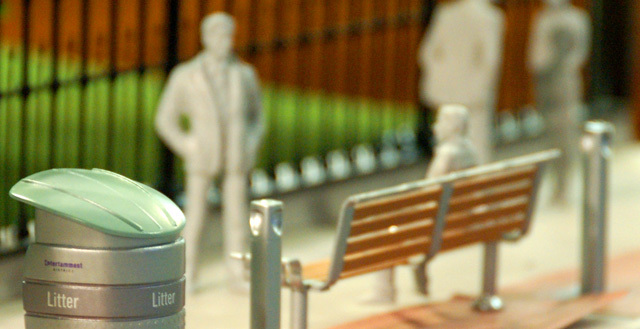 Read on to see some of Astral’s street furniture renderings. NOTE: The renderings below are a few of the multiple versions proposed and don’t necessarily reflect the final design choices. Read Astral’s pitch [PDF] to see all the design options and read more about their utility.